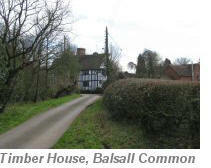 A short gentle 4 mile circular walk from the picturesque village of Barston through the outskirts of Balsall Common. The opportunity to enjoy quiet open countryside and the delights of the Warwickshire landscape. 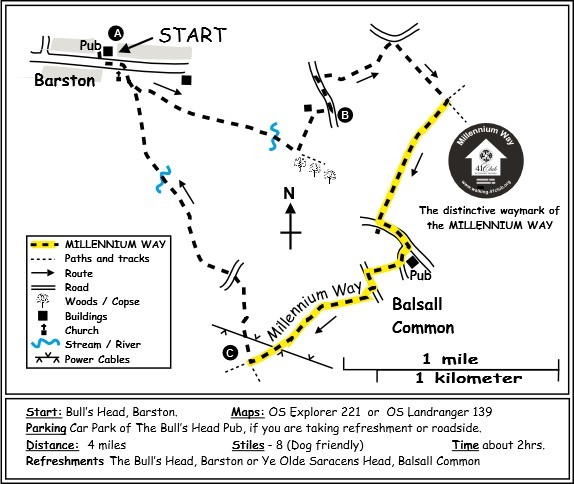 During the walk you travel along a short section of the MILLENNIUM WAY, clearly waymarked with the distinctive black Millennium Way circular waymarkers. Find out more about the walk by clicking on the information icon. Turn left down road out of the Bull's Head car park to find footpath on your right by St.Swithin's Church. Go through gate into churchyard then keep to left of church and go ahead to take wooden kissing gate in corner. Continue betrween fences to then go half left to find wooden kissing gate in far corner (ignore gate on your right.) Continue between hedges to take metal kissing gate into field. Bear half right to go diagonally across field passing just to the right of a small clump of trees in centre of field then take metal gate / kissing gate ahead. Go along edge of field with hedge and trees left. Continue through gated gap ahead then bear right to cross footbridge over stream. On the orher side of the bridge go immediately left then right through wooded area to find and take stile into field. Go with trees right to take kissing gate in corner. Go immediately left to walk along narrow track between wire fences to find metal kissing gate. Take the gate and cross gap to take the other kissing gate and continue along tree lined path eventually entering small field. Continue ahead with hedge and trees left to exit field by low fence gap. Go right on driveway of isolated house (with interesting eyebrow roof feature) to reach road. Go left on road for some 250 yards to find stile adjacent to metal gate on right. Take stile or gated gap and after some half a dozen paces cross hidden stream on left, and cross field bearing right to field hedge corner diagonally opposite, where you will find a waypost. ( If this field has tall crops planted it may be necessary to follow around the edge of the crops to reach the field edge corner as the farmer does not always reinstate the right of way.) At field corner waymarker post bear left and continue with hedge left up field. At top of field go right (ignore stile to road) staying in same field. Go with hedge left to exit first field by far corner gap. Approximately three quarters of the way along next field find waymark post left with numerous way mark signs. Here, turn right across field to join The Millennium Way (From this point you will be guided by the black Millennium Way circular waymarks as far as point C ). Go down field to find bottom left stile. Take stile and go ahead across field taking mid field bridge then forward to exit field by hedge gap. Once through the gap bear right into fenced area and continue along with hedge right to pass through corner gap (with defunct stile) and stay with hedge right to take corner stile to road. Go left along main road passing houses right. Just before Ye Olde Saracen's Head pub turn right into Magpie Lane passing Jessamine Cottage and after a few paces take waymarked metal kissing gate right. Go around fenced field edge with hedge left and fence right (ignorng any gates right in fence), eventually to reach kissing gate to lane. Go left on lane and after approx 85 paces take stile or open gate on right. Go with hedge right, at corner ignore small hedge gap ahead but go left with copse right to follow round to the large open field. Go straight down across centre of field to take footbridge and kissing gate ahead. Continue ahead over field to find a further kissing gate then ahead with short length of hedge left to hedge stile. Take stile and go ahead with hedge left under power lines to corner gap. Here we have reached a crossroads of paths and will leave The Millennium Way by taking the stile / gap at the corner and go right to continue along edge of next field with hedge and trees right to again pass under the same power lines and exit to road at field corner via kissing gate. Cross the very busy main road with care and take kissing gate opposite, then ahead across field to pass mid field yellow topped waypost. Stay forward and on reaching the River Blythe bear right keeping the river and tall hedge left, eventually to pass a waypost left. As the river swings left you will find another waypost. At this point cut diagonally across corner of field to reach a footbridge. Cross footbridge to next field then go diagonally quarter right and exit field via mid fence stile or open gate. Keep ahead up next field with hedge left and exit by corner wooden kissing gate back towards the churchyard. 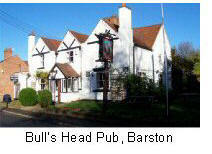 Go to road then turn left back to The Bull's Head. 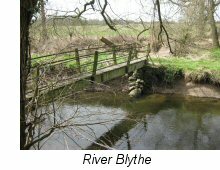 Barston lies in a bend of the river Blythe, which surrounds it on all sides but the north. The village was in the hands of the Knights Templars in the 12th century, then the Knights of St. John of Jerusalem (Knights Hospitallers) in the 13th century. 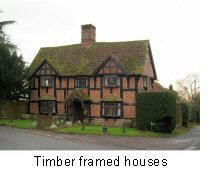 The village has some fine historic buildings, some timber-framed (see picture). 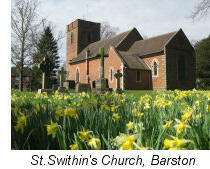 St. Swithin’s church dates from 1721, built on the site of an earlier church. The footballer Robbie Keane owned a house in Barston whilst playing for Coventry City F.C. in the early half of the 1990s. 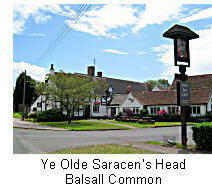 Local Camra pub of the year in 1998, 2002, 2003, 2009, 2011 & 2012, and has been in the guide for 20 consecutive years.